To become our partner you do not need to purchase anything. When you register an account in our system, you automatically join the affiliate program and can use this account for your referrals tracking during the free trial period and after its expiration. 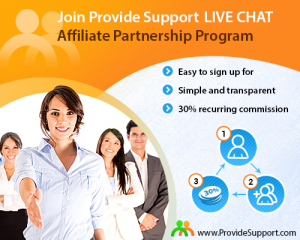 Share your partner link which has the following look https://www.providesupport.com/partner/<your_account_name> or https://www.providesupport.com/p/<your_account_name> (without angle brackets) on your website, embed it into a banner or send your customers and ask them to use it when registering an account. Alternatively, you can add one of our banners to your website. You can also register accounts for your customers yourself, just use your partner link to follow our website to ensure that all registered accounts are added to your list of referrals. Track your referrals on special Partnership / Your Referrals page. Claim your 30% recurring affiliate commission. You will get paid as long as your referrals remain subscribed. This means affiliate payments do not end with the first purchase. 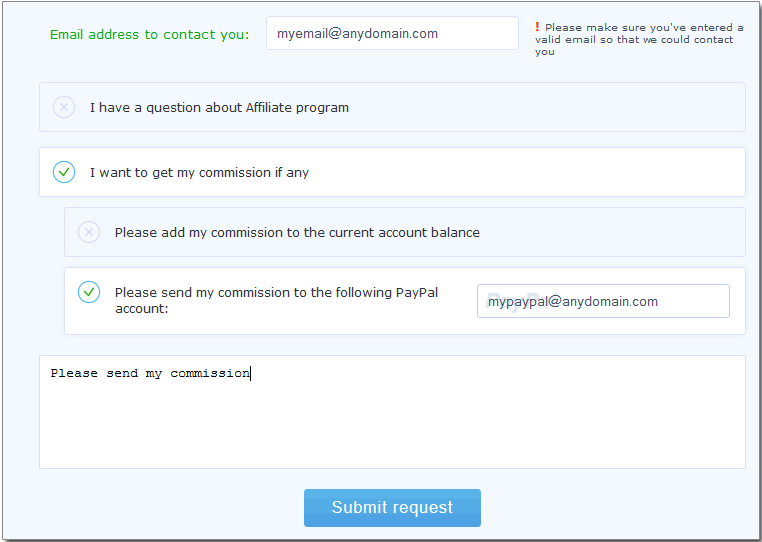 Whenever you would like to get your affiliate commission, check your commission amount or just ask questions regarding the affiliate program, use special form for this purpose. Your request will be processed within 24 hours. Got interested? You are welcome to ask your questions in the comments to this blog post or use the chat button to contact our support team. This entry was posted in Articles, News and tagged affiliate program, partner program, partnership opportunities. Bookmark the permalink.